« Star Wars – The Force Awakens – Dare – What I think the plot is (not that anyone but me cares). Well, the time is upon us once again and the Pikes Peak Writers Conference is now over. Folks are no-doubt returning home refueled and equipped with new tools to tackle their magna opera. I’m led to believe that at this latest PPWC, none other than Pam McCutcheon taught the plot grid class. Using a plot grid isn’t hard and YMMV as to its use. Some writers swear by them. 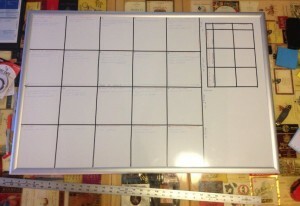 Other writers feel that by filling out the entire plot grid, it robs their stories of creativity and takes away their incentive for pressing forward since they already know how the tale will end. Me? I adore them. I love filling it out when I come up with a new idea and it really helps me brainstorm all the key throughlines of the story. 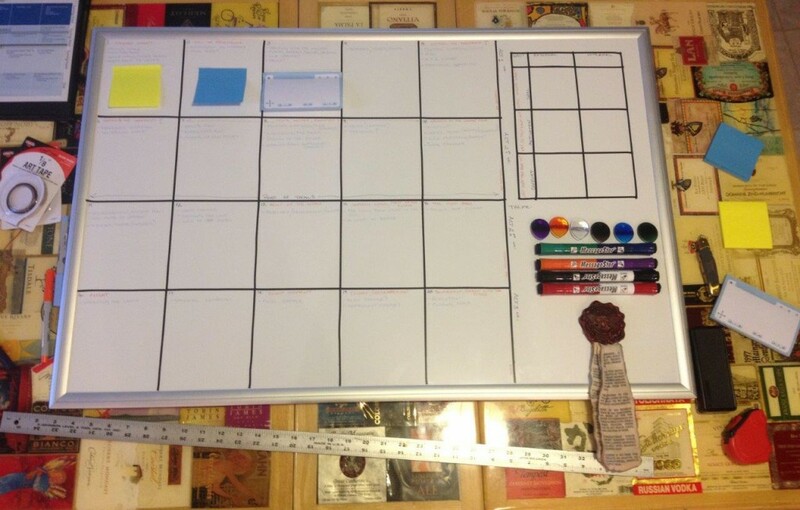 Having said that, I tend not to stick to the plot grid too religiously and deviate from it quite often and then go back and change up the Post-Its or rewrite my dry-erase notes. 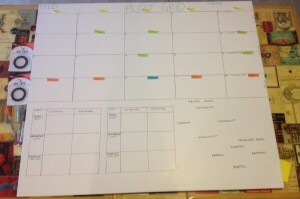 So how do you build a plot grid? Super-easy. 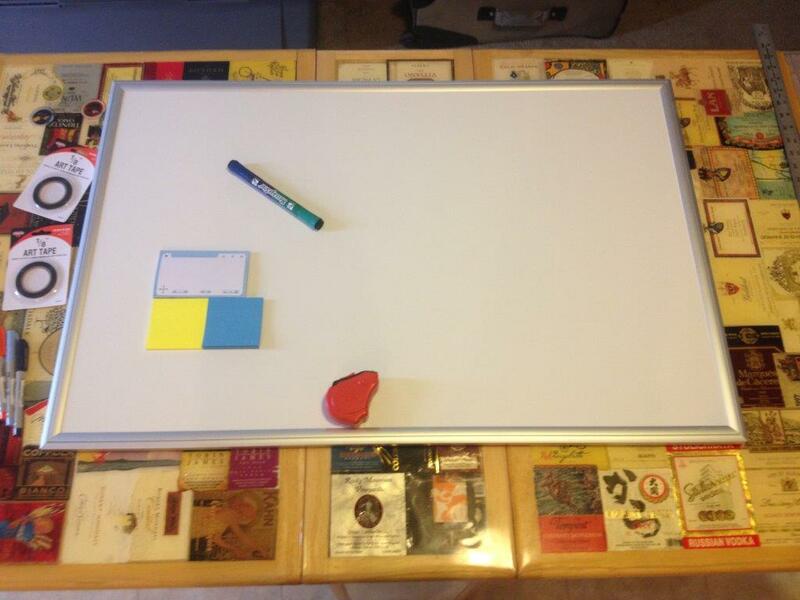 Get a large piece of foamboard/posterboard (many writers favor the trifold science-project special foamboards). Get a sharpie. Draw a 4 x 5 grid of 20 squares each about a Post-It note in dimension. And Bam! On the very basic level, you’re done. 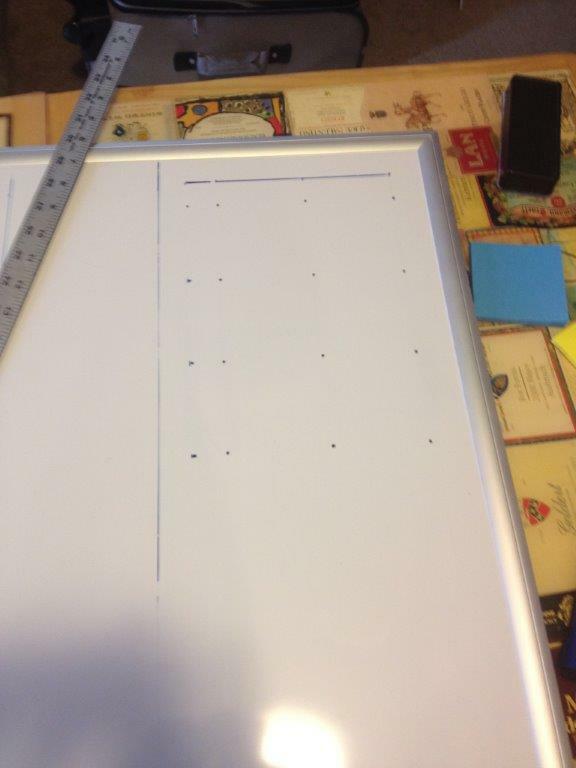 This is the standard posterboard plot grid. 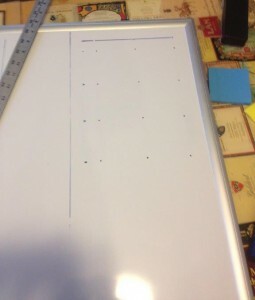 Very cheap, very functional, but not magnetic or dry/wet erase. However, if you’ve been following this blog at all, you know I always have to take things to the next level. 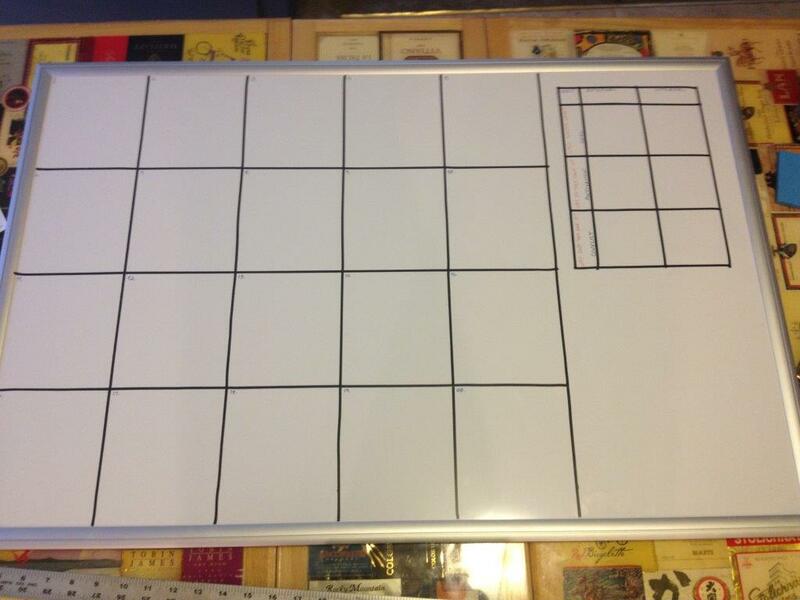 I also like writing on my Plot Grid board. 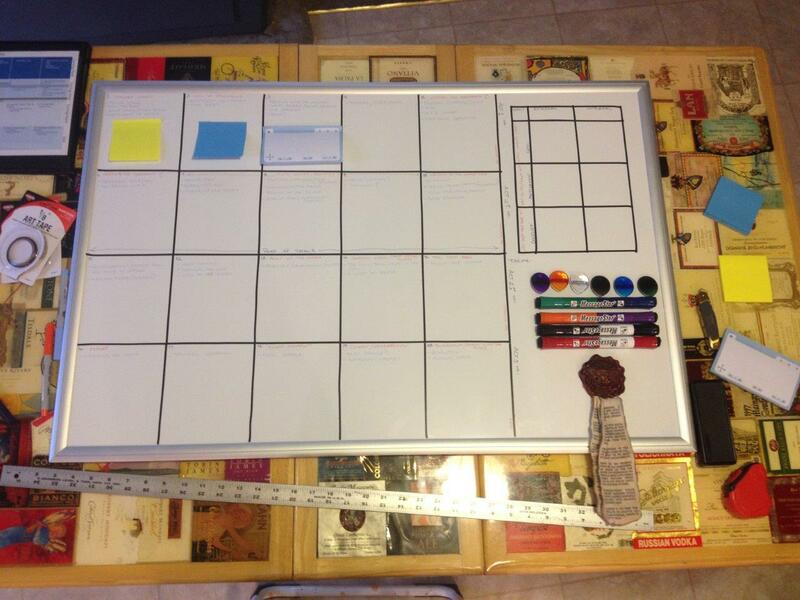 On regular posterboard, that limits my ability to re-use the board for other projects. 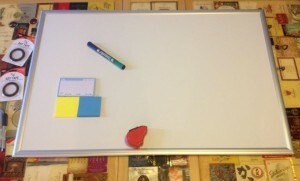 So I wanted my board to be a whiteboard, preferably magnetic. 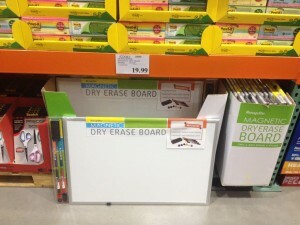 Costco had this incredible whiteboard complete with eraser and double-sided dry erase markers for $19.99. It’s pretty big too at 24″x36″, it will do the job well. 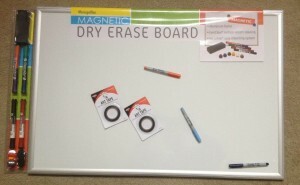 $19.99 gets you a magnetic dry/wet erase whiteboard. 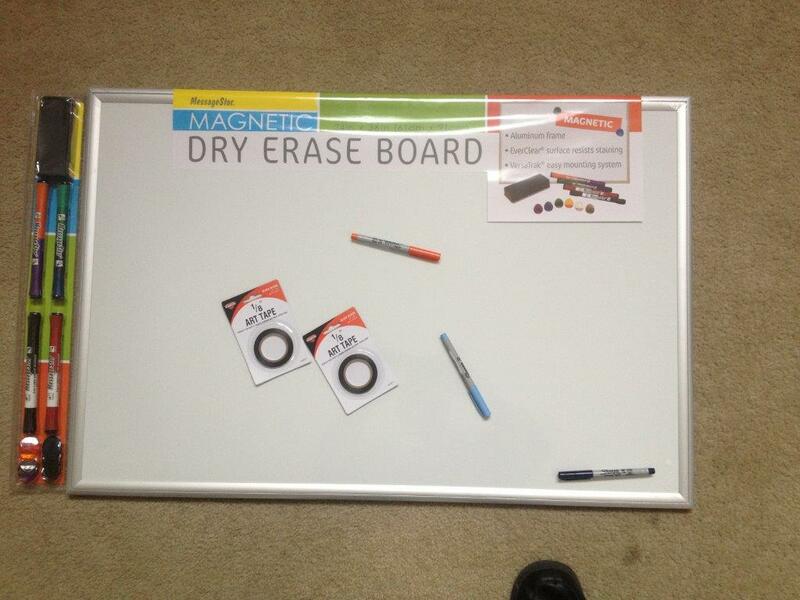 With mounting hardware, magnetic double-sided dry erase markers, magnetic eraser, and magnetic clips. Hard to beat this kind of bargain! 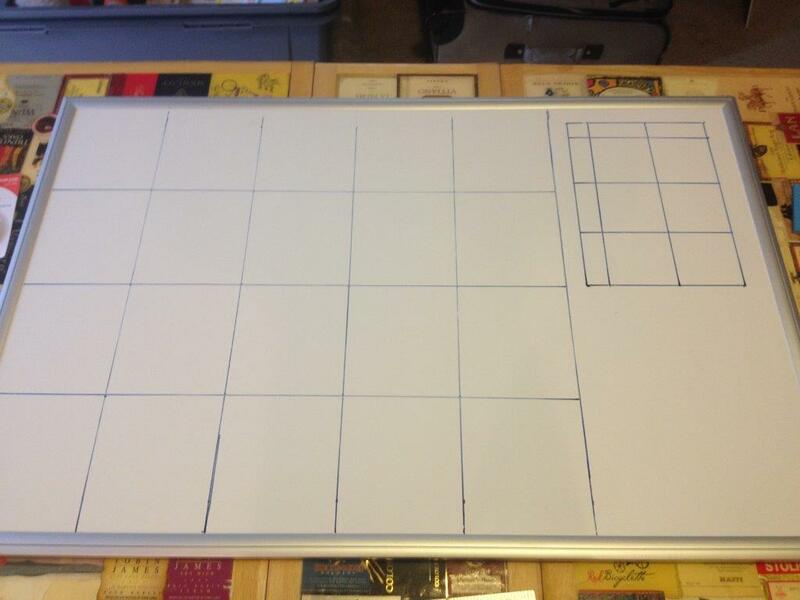 Next comes the task of how to put the lines for the plot grid itself. A black medium point permanent marker fits the bill. But what if I mess up while drawing the lines? Art tape (sometimes called graphic tape or chart tape) is the ideal solution. It is made to stick to whiteboards, goes down in straight lines, and you can easily peel it up if you make a mistake. Office Max sells rolls for about $3.00. I went with the 1/8″ width but I think the 1/4″ might have worked just as well. I just wanted the thinnest lines I could get. Also, while you’ll see two rolls in the pictures, I wound up using only just half a roll for this project. So just one roll will work. 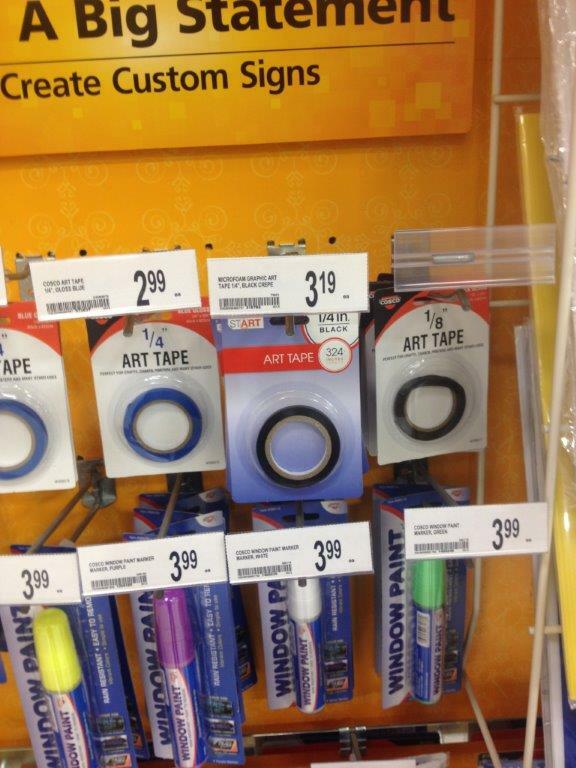 Art tape. Pick this up at Office Max for about $3.00 Makes nice “permanent” lines on the board which you can peel up later. And it goes down in straight lines. 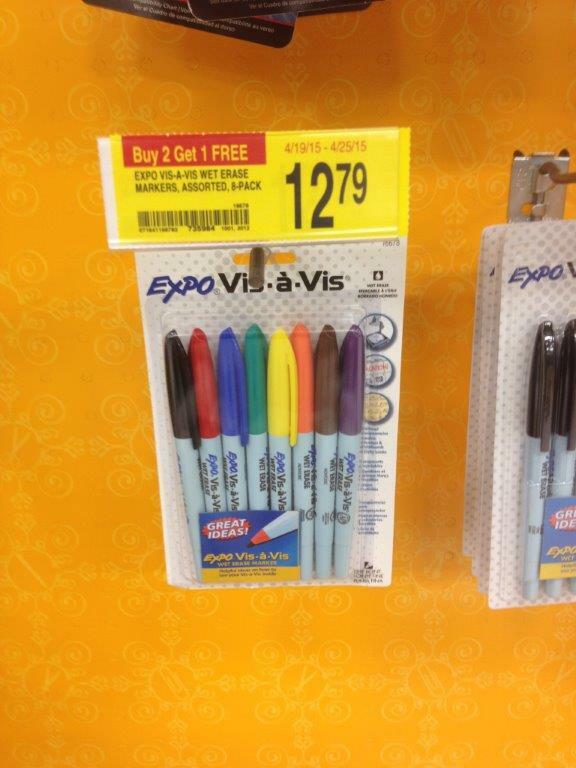 I also picked up some fine-tip permanent markers in some colors I felt would work on the board without being obtrusive. So I picked up a dark blue for labels, orange for stages along the Hero’s Journey adapted from Christopher Vogler’s The Writer’s Journey and a light baby blue for notes adapted from Alexandra Sokoloff’s excellent ScreenWriting Tricks for Authors. Here’s all the stuff I got. Wound up costing me about $32. 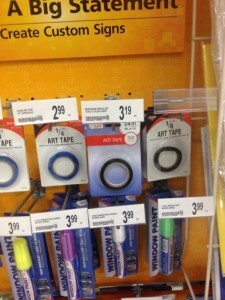 But if you already have or don’t need the fine-tip Sharpies, you’re spending less and honestly, you only need 1 roll of the art tape. Next I needed to lay out the plot grid. When laying out the grid, keep in mind that the entire thing is driven by the size of the Post-It notes you’re going to use. Standard size is 3″x3″. I also like to use wider Livescribe sticky notes or multiple Post-It notes, which I often cut down to strips. 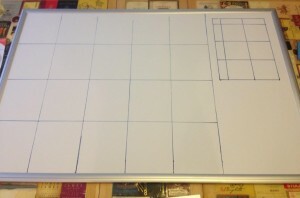 I decided to go with a 5″ width for my Plot Grid rectangles. Here I lay out all my supplies. 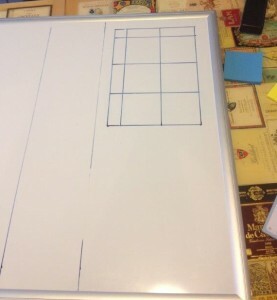 The Post-It notes are there as size references for the size of the grid squares. I let the height of the board determine the height of the rectangles. 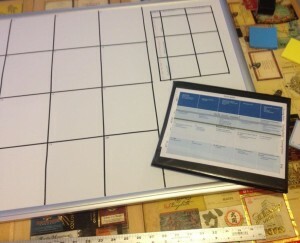 I also measured out the Goal, Motivation, Conflict Grid that would be on the side. 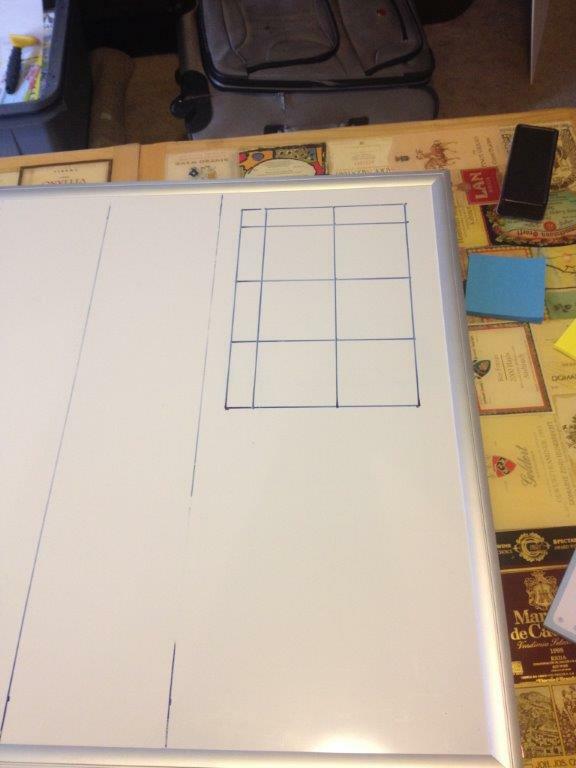 This grid is also determined by the Post-It note size of 3″x3″. Unfortunately, that didn’t let me put two G.M.C. grids on the side of the Plot Grid. So I left a blank area beneath the G.M.C. grid for notes. I’ve found such an area useful in the past on other boards, so it was nice to have here. Measure out the GMC grid. I went with 1″ boarder on the side and on the top for titles and then the grid squares are 3″x3″ to accommodate a standard Post-It note. The Goal, Motivation, Conflict grid on the side. Here is my Plot Grid set up with dry erase marker. I will use these lines as a template to put the art tape over them. Next I took the Art Tape and just unspooled what I needed and lay it down covering the dry erase guide lines I had made. 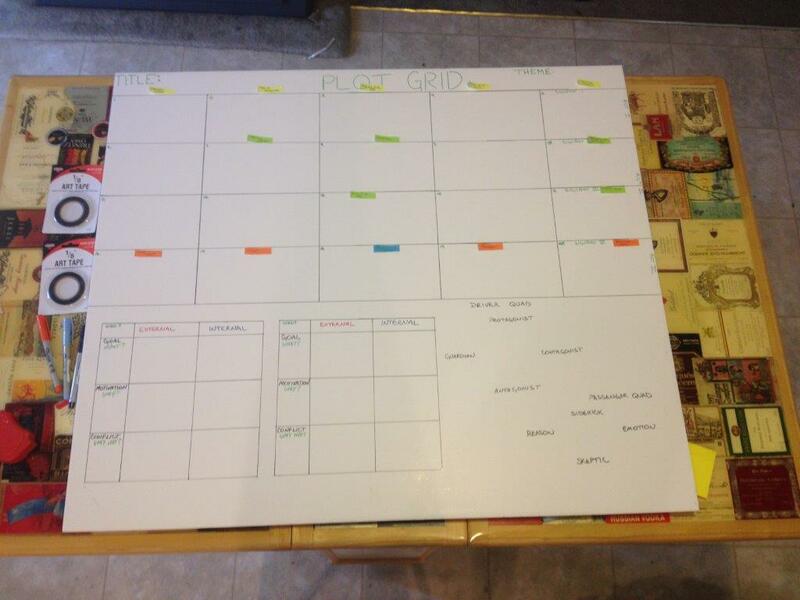 After this stage, your Plot Grid board is essentially complete. Here is the Plot Grid after I put all the art tape over the lines. The Plot Grid is effectively completed at this point. I like to add permanent details to my Plot Grid as memory joggers. 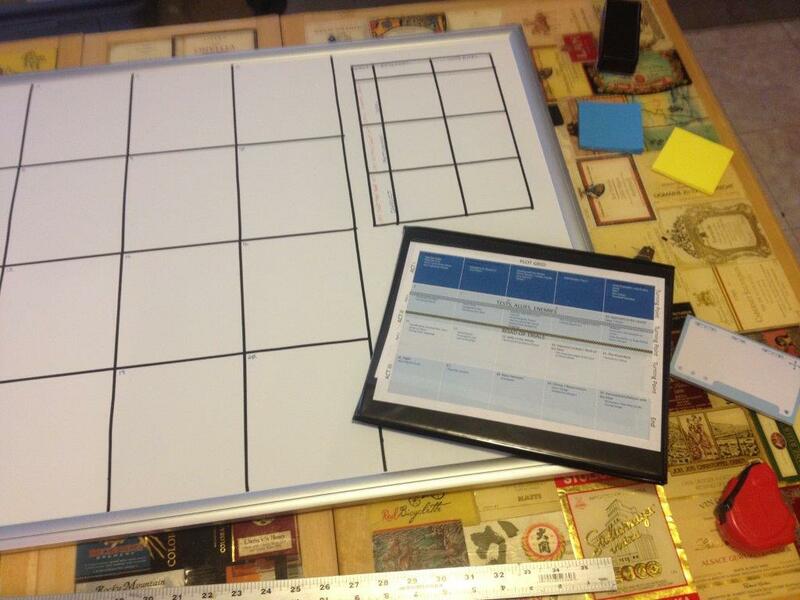 Here I take a graphic that I use for brainstorming and transcribe it onto the Grid. 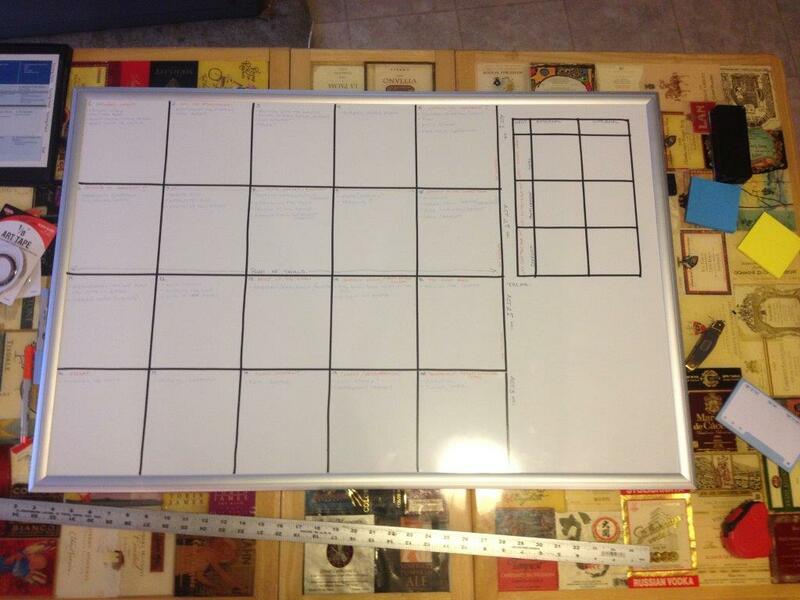 A shot of the Plot Grid filled out with notes from Alexandra Sokoloff and Christopher Vogler. I wanted to add some permanent notes to the board. So I took out the fine tip Sharpies and very carefully numbered the grid squares and added the titles and notes I wanted to. Due to the colors I chose, the notes are hard to see in the pictures. But in person, they are easy to make out without jumping right out at you. The file I used as a guide is a small regular page brainstorming tool I put together. (You can get it here:Plot Grid2). And that’s it! It took me about an hour and a half to assemble the whole thing. Also, I don’t think I would use the mounting hardware that came with the whiteboard. I would use those 3M fixtures that look almost like Velcro (3M Command Strips). They do less damage to the wall and allow easy removal of the board if you want to travel with it. Hopefully this was helpful. Here’s one final picture of the board with the magnetic dry erase markers, magnetic eraser, magnetic clips, and an Imperial Purity Seal on it. 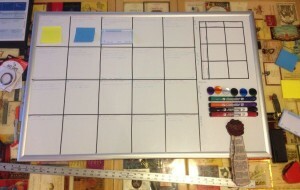 I hope the Plot Grid Board works for you as well as it works for me. I love it! Here we are with the Plot Grid completed. And it’s even been sealed for purity in the Emperor’s name!